Yard Gard Multi-Animal repellent is designed to deter a variety of animals that forage for grubs, insects, and other underground food. These animals have a keen sense of smell and we use their senses against them by creating a barrier in the soil that sends them away. Our all-natural repellent is made from all organic ingredients so that your family and pets are safe. 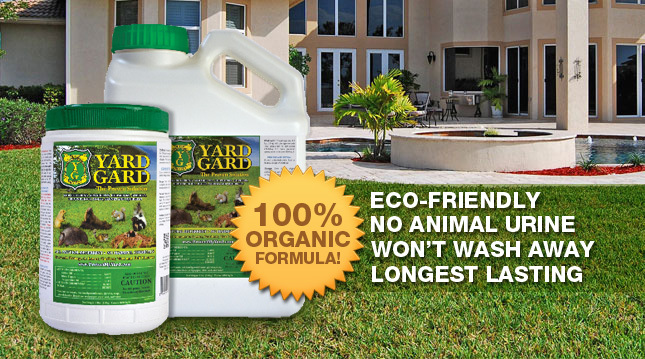 Yard Gard Multi-Animal repellent removes digging critters from your yard safely and effectively, without harmful chemicals. See more general information on chipmunks below. If you need any additonal assistance don't hesitate to call our Technical Support Team at 1.855.665.3746. Their diet is made up of nuts, acorns, seeds, mushrooms, fruits, berries and corn. It also eats insects, bird eggs, snails and small mammals like young mice. Yard Gard was effective in deterring the animal in the evaluation studies using Yard Gard Multi-Animal Deterrent.